Synthesis Reactors and Automated Lab Reactors provide an innovative platform for chemical synthesis, development and the kilo lab. These chemical synthesis and process development tools open new possibilities to discover synthetic pathways, explore conditions, and optimize reaction parameters. Depending on the operating volume and the goal of the investigation, researchers choose between different versions of synthesis reactors or automated lab reactor control. Customizable, application-specific tools and workstations range from entry level to advanced. 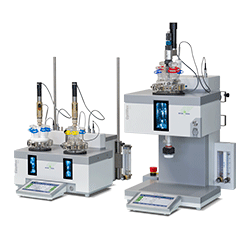 Existing synthesis reactor systems and lab reactors, including common jacketed lab reactors, can be upgraded to offer additional functionality, control capabilities and smart data management. Today, researchers apply effective and enabling technology solutions to expand the research and development of innovative molecules and optimized process conditions. Synthesis Reactor technologies open new possibilities for control, optimization, and reporting of critical process conditions. 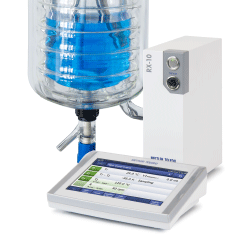 Replace the round bottom flask and reduce chemical development times with more consistent, repeatable experiments and earlier understanding of ideal reaction parameters. Control jacketed lab reactors with third party heating and cooling systems, liquid addition, stirrers, and PAT tools.